Relationships Between Mothers and Daughters - Their Emotions are Similar. Relationships between mothers and daughters are always an unbreakable bond because they are similar to each other emotionally. It's natural that in a family where you have one male child and one female child, the male child is more attached to the mother and female child is more attached to the father. But as they grow up, even after their father and mother show support for their female and male child, there exists a bond that grows much deeper between the mother and the daughter. Even after the little girl grows up to be a woman, she does not push her mother away. 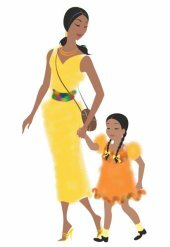 The different life stages go in conjunction with the mother daughter relationship. Mother and daughter find in each other the source of great comfort and also great pain. A daughter's relationship with her mother is different than with her father. The daughter can feel free to speak about more issues with her mother because the mother can possess a better understanding of the situation. There is a popular proverb which states "There is no need to look at the daughter once you see her mother". For most children, it is their mother standing behind their success. That's why the world started celebrating Mothers Day with full enthusiasm and delight. Let us all love our mothers. Return from Relationships Between Mothers and Daughters back to the Mother Daughter Relationships page. Return from this page back to the Home page.